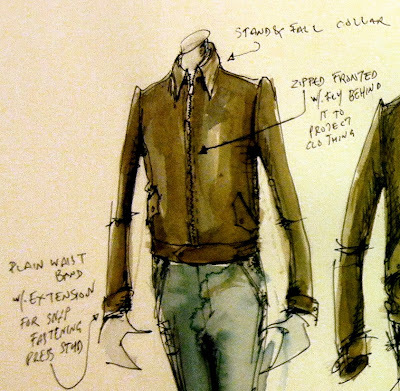 There are very few bespoke tailors I would have faith in to explore an entirely new style or new medium. They include Lorenzo Cifonelli, Davide Taub and Rubinacci (Luca plus cutter). Many more, although highly innovative, tend to make within a definite style: I would put Edward Sexton, Tom Baker and Joe Morgan in that group. It was to Davide Taub, in his pivotal role at the new Gieves & Hawkes bespoke team, that I turned to for an entirely new bespoke project: a leather jacket. Davide has experience in this area, having created blousons in all sorts of materials while at Maurice Sedwell. In fact, when we started talking about this project it turned out he has been working with a leather specialist in his spare time, helping him develop his ready-to-wear models. In my experience, work such as this on RTW proportions and grading is invaluable, and shunned undeservedly by a lot of tailors. 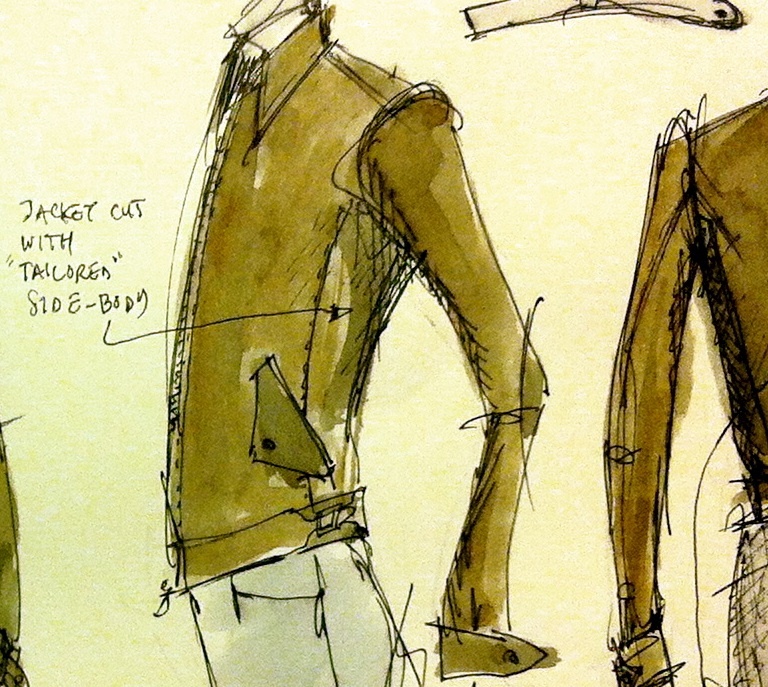 The idea for our jacket was to create a simple, zip-up blouson in a veg-tanned, naturally finished leather. The finish on the leather should make up for the fact that most modern jackets go through a ‘distressing’ process to make them look old and worn, particularly around the seams. Although simple in design, the jacket would include quite a few features from bespoke tailoring. The shoulder would have a thin pad, the chest a slim piece of canvas and, most noticeably, the sleeve would be cut to drop down vertically from the shoulder. Casual jackets are usually cut with the sleeve at almost right angles to the body, to allow for plenty of movement up and down. A handmade jacket, with its larger sleevehead and small armhole, can get away with being almost flat to the body. It’s going to be an interesting journey, and doubtless the design that Davide sketched, above, will change over the fittings (in waste cloth). Hopefully what we end up with will be both stylish and unique. You can follow the discussion on The bespoke leather jacket: Part 1 by entering your email address in the box below. You will then receive an email every time a new comment is added. These will also contain a link to a page where you can stop the alerts, and remove all of your related data from the site. Now THIS I cannot wait to see. Very cool bespoke project! Ah. I’ve been meaning to email you to ask whether you might consider more projects related to outerwear, and in particular what experiences and insights you might have regarding bespoke tailors working with materials other than regular cloths. I’m quite slim and almost all RTW shirts fit me like a bin-bag but the solution is simple provided that the funds are available, simply go to a bespoke shirtmaker. A similar solution is also available for ill-fitting great coats, covert coats, duffle coats etc. My issue however is that I’d love to have something like a Barbour Sapper jacket in my wardrobe but they just don’t fit me very well or are plastered with egregious branding. It’s hugely interesting to see you embarking on this bespoke leather jacket project and I will watch with great interest but, since you’re breaking out beyond the boundaries of the usual bespoke tailoring fabrics, I wonder whether you might be able to quiz David Taub or any other appropriate contacts regarding the possibilities of sourcing and working with other materials such as light summer waterproof materials. A properly tailored lightweight summer mackintosh would also be of great interest to me. 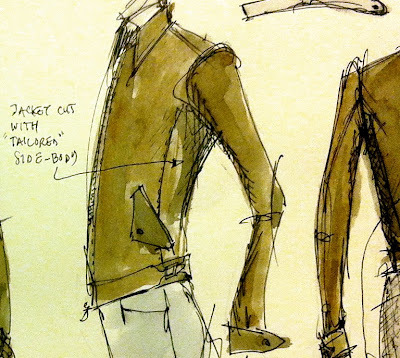 Commissioning a Harrington jacket with a few design tweaks would be another project that I would like to undertake but again this would require a lightweight waterproof material and I’m not sure if any tailors would be able to source and work with such a material. Keep up the great work Simon. I love your blog and have found it an invaluable source of information and inspiration during my first 18 months or so of bespoke adventures. Most of those ready-to-wear pieces can be altered by a tailor. The only things you risk are creating an odd look at the seams if it is piece-treated, so the treatment along the seams will now disappear at some point, and changing the style. I have had blousons altered at Graham Browne before, for example, but then considered that the shape was better as originally designed. The aesthetic is just not the same as a tailored jacket – no suppression at the waist, for example. You can also alter or create waterproof pieces. You just need a tailor who can tape the seams afterwards, otherwise you will lose that waterproof quality at the seams. And it will still look a little odd if taping seams is not the method used for waterproofing elsewhere on the coat. Finally, you can certainly use materials other than leather. A linen blouson, for example, would actually be a lot easier than leather for a tailor. The problem is design, not material. Why would a tailor know exactly where and a what angle a pocket goes on such a jacket, when they’ve never made one before? Sounds like a great project , look forward to further updates. What footwear would you wear with a jacket like this ? Chukka or brogue boots ? In the BBC series on Savile Row (Style Genius) Edward Sexton himself says: “I have not moved to far away from the Tommy Nutter look throughout my career, because I believe it is elegant, romantic, it’s style”.